A periodontal cleaning can also be referred to as Scaling and Root Planing. It is sometimes called a deep cleaning. These terms are often used interchangeably. 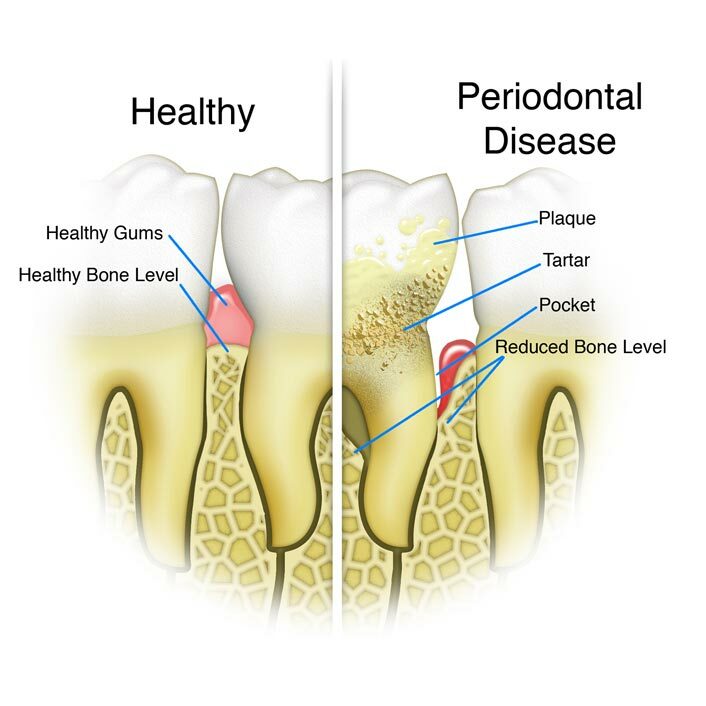 It it important to understand what exactly a periodontal cleaning is and how it differs from a routine cleaning. Routine cleanings are recommended if you have good oral health and so not suffer from bone loss or gum (periodontal) disease. During a routine cleaning, they hygienist will remove plaque, calculus and stains from the surface of your teeth that is visible above the gum-line. For a periodontal cleaning, the hygienist will focus on removing calculus deposits and toxic bacteria from the root of the tooth, below the gum-line. It is recommended for patients who suffer from periodontal disease. Symptoms include bleeding, gingival recession, bad breath and swollen or red gums. A periodontal cleaning or Scaling & Root Planing as it is also called, is the first step in managing periodontal disease and avoiding future tooth look. It may take more than one appointment to complete the entire mouth. After the initial periodontal cleaning, your doctor and hygienist will make a recommendation on how often you should return for periodontal maintenence. We often schedule periodontal maintenance appointments every three or four months. Seeing your back on a shorter interval helps manage your periodontal disease. Occasionally, periodontal disease does not respond adequately to a periodontal cleaning and may require referral to a specialist. To effectively clean below the gum-line, your dental hygienist may numb your gums at the start of the appointment. This allows the hygienist to clean around the roots of your teeth without any discomfort. Hand instruments will be used along with a ultrasonic scaler. The ultrasonic scaler vibrated and used water to break up calculus deposits and flush out debris. A laser may be used to reduce the number of harmful bacteria present below the gums. These procedures are generally painless. Some patients may notice mild tooth sensitivity or gum soreness following a periodontal cleaning.